dance.net - Not dancing yet, but... (10179388) - Read article: Ballet, Jazz, Modern, Hip Hop, Tap, Irish, Disco, Twirling, Cheer: Photos, Chat, Games, Jobs, Events! I can wear 2 shoes again except at work (I walk a lot, and fast, at work) I can start strengthening the muscles on the outside of my ankle. I can start doing 2 footed heel raises I can't do any hopping for jumping for another 2 weeks but this is all serious progress and I am pleased and quite willing to be patient. my 2nd to last appointment I saw my xray and thought it looked like day 1 and he said it was almost completely healed and told me to walk in shoes, 2 footed calf raises, etc. last appt I thought it still looked broken and he said it was absolutely completely healed and even stomping and leaping wouldn't hurt the bone. But to be careful not to cause a new injury since everything was weak. I guess the outside is the last to show healing. I haven't had any problems with it. 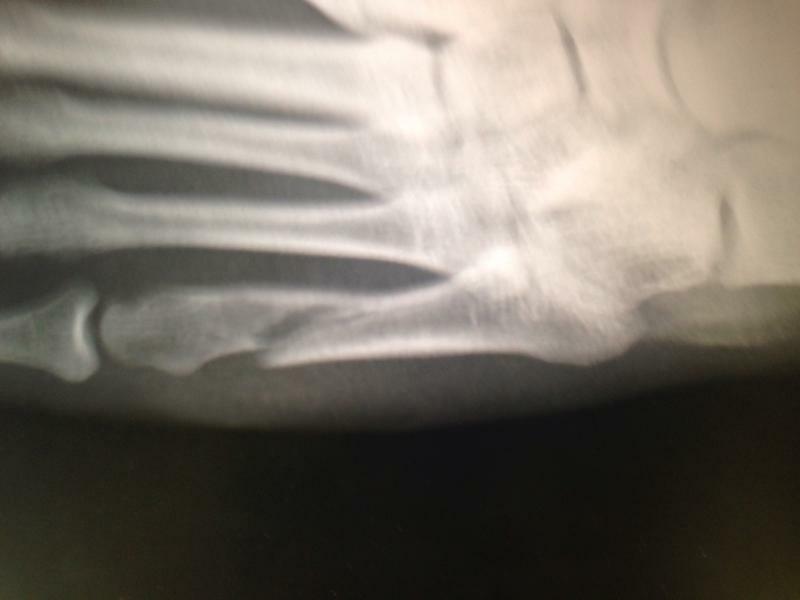 thanks Jen, for posting the X-ray. Yeah, I wouldn't think the second one looked better either! That is even more encouraging! How long was it before you got back into starting hopping, jumping, dancing? I was so paranoid that the dr missed something and something would be wrong and I would need surgery afterall. Two or three weeks after the second photo I had another xray that looked very similar. He said it was completely healed and I was released to ease back into it. But to give it a couple weeks before really jumping or pounding. It will really hurt when you first start but you'll have to push it. And it gets better REALLY fast. Pain=progress. Just be careful to not twist it bc its weak. It was weird for me bc I've been dealing with an old injury. 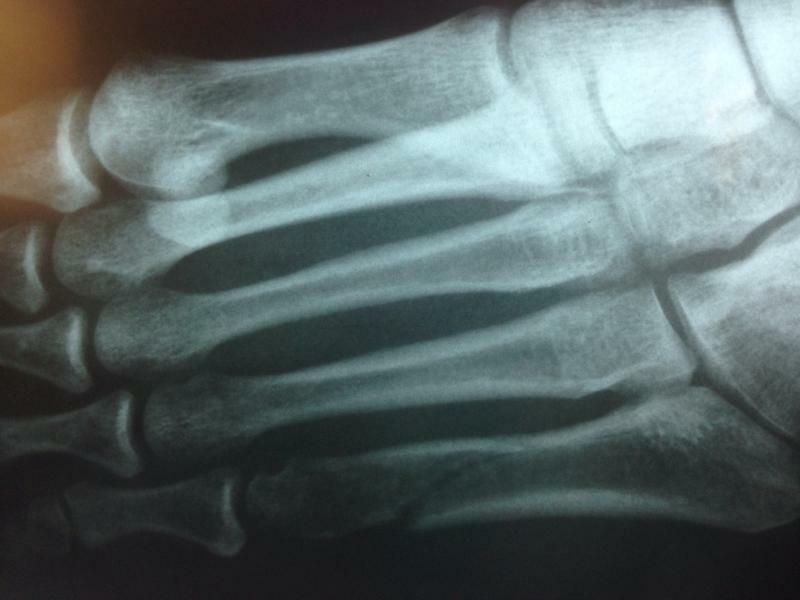 The day I first had it xrayed the dr discovered I broke my foot (in my arch) about 15 yrs ago and never went to the dr and it never healed. Its still broken, and will stay like that. That has hurt more than the new break. I'm just now getting to where I can do soft shoe, and I still can't leap or kick high. I was released middle of January. A girl in my school broke her 5th metatarsal about 8 weeks before I did mine and she won an OC feis like 3 weeks after being released and qualified for worlds less than a month after that. But she pushed insanely hard. I think its different for everyone. Do lots of strengthening, push it so it hurts in the little stuff (calf raises, jumping jacks, straight jumps) stuff that you're less likely to cause a new injury. And listen to your body. I did a lot of straight jumps because it gave the impact without worrying about twisting it. When you're fully released I'd ask weird questions like, "if I stomp as hard as I can will I hurt the bone? If I jump as high as I can landing on the balls of my feet will it hurt it? is there ANYTHING that will rebreak it?" just so you have hte peace of mind that you won't rebreak it. Because drs never understand irish dance.